This are so easy to make, y’all! I made these for my husband during a football game and he LOVED them. He said they were his new favorite snack. 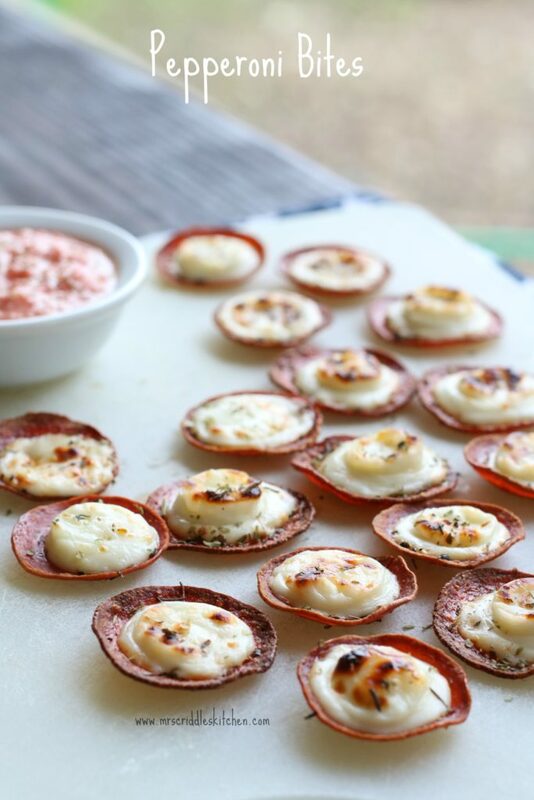 So if you need a good appetizer for GAME DAY, you need to give these guys a shot! These literally have three ingredients and that is ALL! The hardest part is getting the pepperonis to lay flat on the tray, and that’s not hard!! Talk about impressing your hubby with these little guys! Oh and add a delish marinara sauce to dip it in! I like using Dave’s Marinara Sauce! I found it at Sam’s Club. 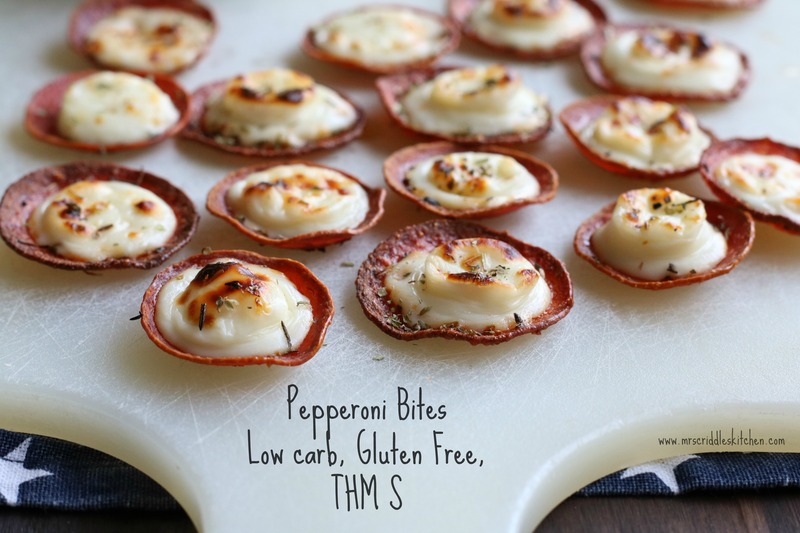 This little appetizer is a Low Carb dish and THM S for my Trim Healthy Mama buds!! 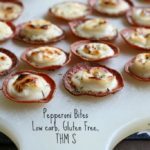 A delish low carb pepperoni bite that is easy and yummy for GAME DAY! Preheat the BROILER on 425 degrees. Cut each mozzarella cheese stick in half and then cut each half in fours… you should have 8 pieces. Place the pepperonis on the cookie sheet. Add one piece of mozzarella cheese bit on top of the pepperoni. 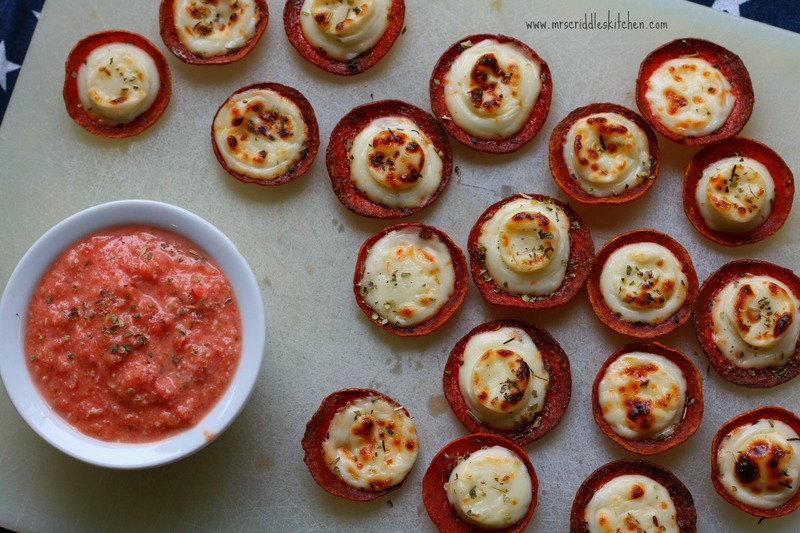 Place in the broiler for 2 to 4 minutes or until the edges of the pepperoni is crisp and the mozzarella is melted and toasted. Dip in a good marinara sauce. Do you slice the mozzarella stick in half down the long side or short side? Thanks! Thanks! I used to have lots of appetizer recipes pre-THM. However, I have a hard time finding ones now that my family enjoys as much as I do. They all love pepperoni, and I can’t wait to make these! They will be perfect for all those finger-food gatherings that I never know what to take with me! You are so welcome! I tried these out on my husband and he absolutely loved them. He’s on plan with me half the time so that’s a good complement. Oh go check out my new Bacon-Wrapped Buffalo Bites too! SOOOOOO GOOOD! My broiler feature on my stove only has high and low. Can I bake these in the overnight on 425 or do I broil on high and keep a close eye on them? Do you know about how many is good for an S snack? My son (12) and I made 30 today because that’s what fit on our small cookie sheet. They took a little over 5 minutes on Broil setting. He sliced the mozzarella a little thick and I don’t think he counted correctly each time. Some of the cheese pieces were pretty big…lol. They turned out great though! I can’t wait to try them tomorrow. We were glad the parchment paper absorbed a lot of the grease, which helped with clean up. I tapped the “bites” a few times with a paper towel afterward also. Thanks for the recipe! Boar’s Head sells large sliced pepperoni, and I use these to make pizzas using the pepperoni as the crust. My biggest frustration is trying to keep the shredded cheese from being messy. Thanks for the idea to use cheese sticks. Genius and delicious! 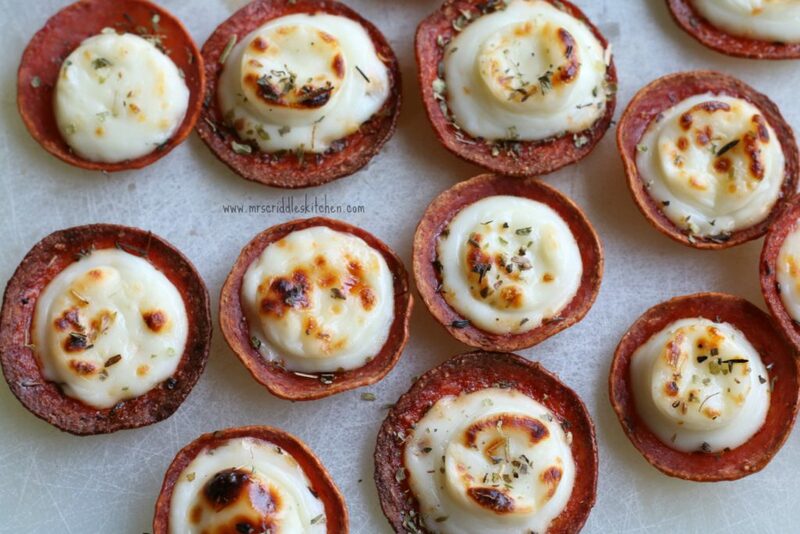 Who need pizza with these super easy, quick snacks! Thank you!! Has anyone tried putting a tsp. or so on the pepperoni, then the cheese? I’m wondering if it would run off. It might run… but not too much!